The company is headquartered in Paris, where it has a tasting room and wine shop on the Rue de Rocher, and claims to have 60,000 subscribers. But for UK wine lovers there are two levels of subscription for direct wine delivery – ‘Grape Expectations’ at £24.90 per month, and ‘Age of Raisin’ at £39.90 per month. One interesting idea is that you can ‘skip’ months at any time via their website, and you can also cancel completely at any time with no penalties. 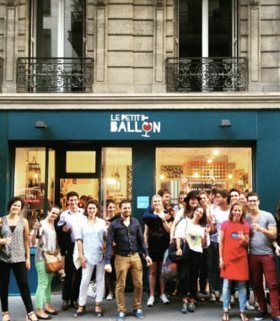 See lepetitballon.co.uk. Le Petit Ballon sent me a trial of a two bottle selection from one of their monthly ‘Grape Expectations’ offer, which came with useful and collectible A5 information cards on each wine. (2018) Michel Rolland is consultant for this estate, and presumably this blend of Syrah, Cabernet Sauvignon and Pinotage. The latter is fairly obvious on the nose, somewhere between smoky and a tiny bit rubbery depending on you viewpoint, but the meatiness of the Syrah and black fruit cassis of the Cabernet are there. In the mouth it is a big, bold but savoury style, the stripe of tannins drying the mouth, the alcohol a tad prominent, and in some ways this is an old-fashioned feeling Cape red - once again, a good or bad thing depending on your viewpoint. (2018) A Bordeaux Blanc blending 70% Sauvignon Blanc and 30% Semillon, the grassiness and bold stone-fruit aromas of the Sauvignon just about dominate the nose, but there's zesty lemon and a touch of chalky minerals too. On the palate this is keen and focused, with none of the tropicality of some Sauvignons, instead cool orchard fruit bite and plenty of zipping citrus freshness leave it tongue-tingling and juicy. Seafood and sushi would seem like natural bedfellows.